Scam-ridden UPA suffered another body blow today with its auditor estimating windfall gains of Rs 1.86 lakh crore to private firms due to non transparent allocation of 57 captive coal blocks to them between 2004 and 2009. Panic gripped villagers of Abdulian and Chandu Chack after Pakistan Rangers opened unprovoked and heavy fire on Indian posts along the International Border (IB) in the RS Pura sector, killing a BSF constable late last night. Pakistan has violated ceasefire 11 times in the past 13 days along the 192-km International Border and Line of Control in Jammu and Kashmir. 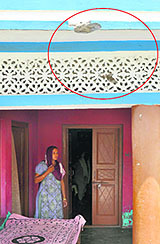 Marks of bullets fired by Pak Rangers which hit the parapet of a house at Chandu Chak village. Former Haryana Minister Gopal Goyal Kanda, who has been absconding since August 8 when he did not appear before the police for questioning in the Geetika Sharma suicide case, will surrender before the police in the wee hours on Saturday, said his lawyers. As people from the North-East continued to flee from Karnataka and Maharashtra amid fears of backlash in the aftermath of Kokrajhar violence, Prime Minister Manmohan Singh today promised immediate action to control the situation. Nearly two weeks after six Sikhs were killed by a white supremacist at a Wisconsin gurdwara, a member of the same shrine has been shot dead in an attempted robbery, sending shock waves among the community members.